Police district commanders recommend honoring officer and volunteer who shot Jaffa murderer after he was wounded - what about Elor Azariya? The Israeli police are recommending to give an honorary citation to a patrol officer and a police volunteer who killed the Arab terrorist responsible for the lethal Jaffa (Yafo) stabbing attack in early March. In the attack on March 8, the terrorist murdered US tourist Taylor Force and wounded 12 other victims, before the officer and volunteer shot and wounded him, and then as he was wounded shot him again and killed him. Jaffa district police commander Brig. Gen. Yehuda Dahan wrote a recommendation to give the officer and volunteer a citation, as revealed by Walla on Sunday. "They strove to confront (the terrorist) in this act, and by doing so prevented harm to additional citizens," wrote Dahan in his recommendation. The recommendation was approved by Tel Aviv district commander Maj. Gen. Moshe Edri. Now a committee led by the police human resources branch head Maj. Gen. Gila Gaziel will discuss the recommendation in the coming days and decide whether or not to act on it. According to indications reported by Walla, the patrol officer who first shot the terrorist will receive an honorary citation, while the volunteer who shot the terrorist as he lay wounded will receive a certificate of appreciation. In the attack in Jaffa, the officer and volunteer were filmed shooting the 22-year-old terrorist Mohammed Masalah as he lay wounded on the ground, in a parallel to Azariya's case that highlights the wildly different response from the establishment. 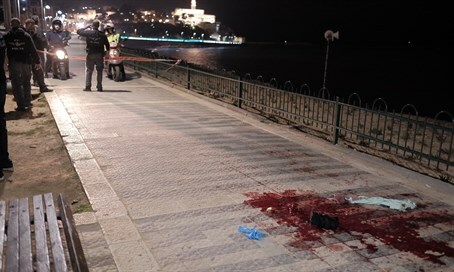 Footage from the incident showed the two chasing after the knife-wielding terrorist from Jaffa Port heading northwards. He ran on the promenade and stabbed passersby. The officers then shot the terrorist, and several minutes later the volunteer was seen shooting him again. The volunteer explained that he identified additional danger from the wounded terrorist, and therefore shot at his arm to neutralize the terrorist. In the film, the volunteer was seen aiming his weapon at the wounded terrorist lying on the ground from a distance of several meters. People standing around the volunteer are heard telling him, "shoot him in the head, don't be afraid, shoot him in the head." After the volunteer fired, one of the people at the scene was heard praising him. While the Police Investigation Unit (PIU) announced it intended to investigate the incident, an investigation was never launched. By contrast, Azariya immediately had an investigation launched against him with leading politicians condemning him before any results were found. Video of the incident filmed by the radical leftist NGO B'Tselem showed Azariya shooting the terrorist lying on the ground in a heavy unseasonable coat. Azariya's claim that he shot over fears the terrorist was moving to detonate a hidden bomb were supported by numerous sources confirming fears of a bomb belt had not been ruled out.